Heat oven to 180⁰C and line two trays with greaseproof paper. On one tray place apple pieces and on the other half of tray place Brussel sprouts. Toss Brussel sprouts with 2 tablespoons olive oil, thyme leaves and sprinkle with sea salt. In the middle of the second tray place Vegie Delights Vegie Roast, then arrange carrots around the Vegie Roast. Drizzle Vegie Delights Vegie Roast and carrots with remaining olive oil. Sprinkle carrots with cinnamon and 2 teaspoons orange zest, toss to coat evenly and rub olive oil around VEGIE ROAST. Cook in oven with Brussels sprouts and apples for 30 minutes. Make orange syrup whilst roast is cooking. Juice the orange and soak cranberries in orange juice. 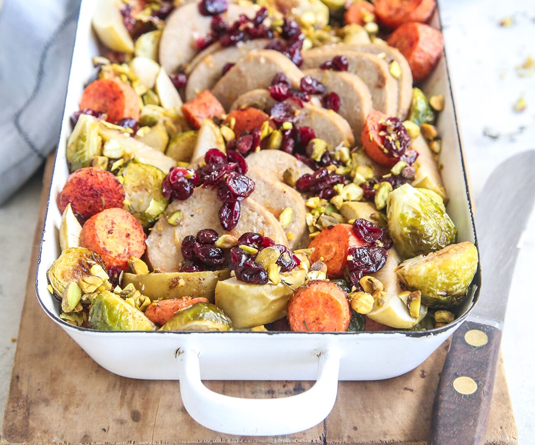 Serve Vegie Roast by slicing in 8-12 pieces once cooked, arrange apples, Brussel sprouts, carrots and Vegie Roast on a serving platter, spoon over orange juice and cranberries, sprinkle Vegie Roast with pistachios, season with sea salt and black pepper and serve.